Booking a flight on this popular budget airline’s website has always been fairly easy, and this app makes it even easier. Everything great about Southwest.com (booking flights, renting cars, checking flight status, accessing Rapid Rewards accounts) is available here. Plus, the app features DING!, meaning you get instant access to exclusive, limited-time-only airfare deals as they’re announced. Kayak.com is one of our favorite places to find cheap airfare and hotel deals, and its app doesn’t disappoint. It allows you to book online with the airline or hotel site of your choice and even offers an option where you can call and book travel with an actual human being. It also shows bonus hotels not normally available online. Remember on family vacations when your dad would keep track of all the vital trip information in a folder? Well, this app is just like that folder. 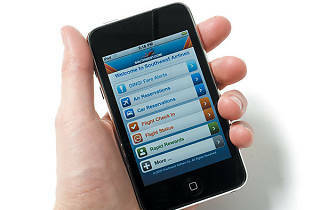 Keep track of your route, booking codes, confirmation numbers, seat assignments and other details. Plus, you can write notes to yourself as reminders during the journey. Even if you’re the type to pack your bags the morning of your trip, this app makes sure you don’t forget a thing. It features template packing lists (and also allows you to create your own) based on your gender and what kind of trip you’re taking (business, vacay). Once you have a list completed, you just check off each item as you toss it in your suitcase and—voila—you’re good to go. Road-trip rage can be a thing of the past, thanks to this nifty app. The application provides local weather (based on local weather stations around cities) and traffic (provided in real-time by users) information as you are traveling. Need to get a room quick? HotelPal allows you to find lodging availability using GPS. It also offers photos, reviews and rates of more than 100,000 hotels worldwide. It’s the perfect app to score a bed if your flight has been canceled and you find yourself stuck in Random Town, USA, for a night. No trip is complete without a souvenir or two. And if you love shopping while on vacay, this app is for you. Yowza figures out your location and then reports on deals up to 15 miles from your device. All you have to do is choose your coupon, and when you walk up to the cashier, show the Yowza!! deal on your screen and let him or her scan the bar code. Just make sure you bring an extra bag for all the loot. How many times have you wandered up and down a terminal in search of a Starbucks, cocktail or healthy meal? GateGuru puts an end to all airport expeditions by locating the best food, shopping and service options within any airport. 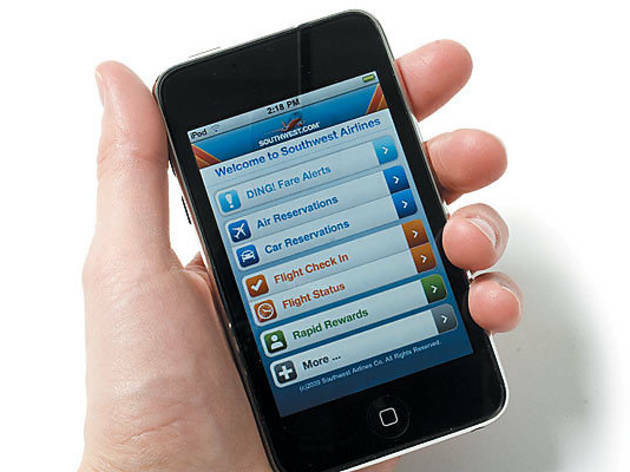 While GateGuru covers the top 85 U.S. airports, the free version of this app allows you to access two of your choice gratis. Yes, you know to ask where the library is in Spanish. But what about some more useful phrases? Choose a language, type what you want translated and the phrase comes back instantly. No, this isn’t the iToilet app George Costanza invented in the Seinfeld reunion on Curb Your Enthusiasm—but it works just like it. The app figures out where you are and locates the nearest available public restrooms. Each toilet has a user-provided rating, so you’ll know which ones to avoid.